Steve has a new hobby. Remember back at Christmas when we gave Steve's parents, siblings and aunt a 'Choose Your Own Adventure' gift? Steve's mom and Aunt Lois joined Trevor and me at Beads on Main to make necklaces. Steve's dad, two sisters and brother-in-law joined him at The Brewmeister for a brewing class. They loved the class so much that they got together a week later at my inlaws' house to try it on their own, without an instructor. Trevor was sick, so I had to stay home with him instead of joining the group. It was disappointing, as I was very interested in the brewing process. Little did I know that Steve would be hooked! He signed up for The Kitchn's Beer School, bought more equipment, and started brewing at home. The process is very interesting. Steve has been brewing 1-gallon batches. The first time, he threw out the spent grains after brewing. 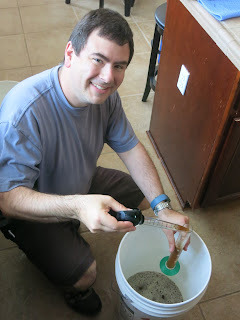 Since then, I've been experimenting with ways to use the spent grain for cooking. I suspected (correctly) that the most common use for spent grains was in bread. I read through a bunch of recipes and decided to try the Brewer's Bread Recipe, which uses a whopping 3 cups of spent grain. It made two large, round loaves (one of which is pictured above). But breadbaking is not a new hobby for me. (Have I really NEVER blogged about this?! I'll fix that soon.) So while I'll continue making spent grain breads, I'm trying recipes that really push me out of my comfort zone. There are some fascinating spent grain recipes out there. More to come! How awesome!!! Very cool hobby for him and that bread looks delish!!!!!!!! Gosh, I love bread and that bread looks soooo good! How awesome for Steve that he enjoyed the class and discovered a new hobby! Your bread looks good! Sounds like a fun new hobby for the hubby!